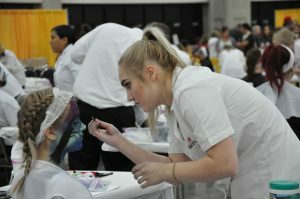 Laci Eckles applies finishing touches to model and fellow classmate Maddi Hicks during the Esthetics competition at SkillsUSA national leadership and skills contest in Louisville, Kentucky. Eckles, a recent graduate of the Cosmetology program at Meridian Technology Center, won first place at the state level and advanced to compete against other first place winners from across the country. The Esthetics contest evaluates the contestants’ techniques and professionalism in the field of skin care. Students were tested in four different areas. Eckles placed in the top 20. 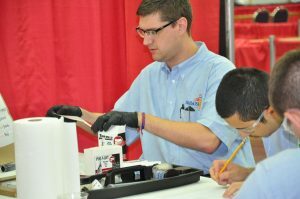 Spencer Strickland, left, bags evidence as part of the Crime Scene Investigation competition at the SkillsUSA national leadership and skills contest. Strickland and his teammates Adam Foulke, center, and Kevin Shiplett, right, were required to process a mock crime scene, demonstrating their ability to legally search for, properly collect and remove evidence of the crime. As students in the Information Technology program at Meridian Technology Center, team members used skills they learned investigating cybercrimes to win the state contest and placed sixth in the nation. 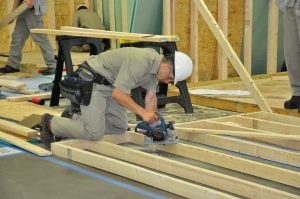 Meridian Technology Center Carpentry student Tray Clinesmith works on building a stud wall during the Team Works competition for secondary students at the SkillsUSA national leadership and skills contest. Clinesmith spent three days working with students Austin Mears, Jadon Norris and Alexander Ingram to construct a project and demonstrate their carpentry, electrical, plumbing and masonry skills. The team won eighth place in the nation. Stillwater student Christopher Brubaker prepares to lay brick on a structure that he and students Guy Major, Seth Flack and Seth Santiago built during the SkillsUSA Post-Secondary Team Works contest. Brubaker and his teammates won first place at the state contest and placed fourth in the nation. 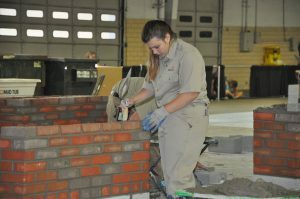 Faith Howell adjusts her brick alignment in the Masonry contest at the SkillsUSA national leadership and skills contest in Louisville, Kentucky. 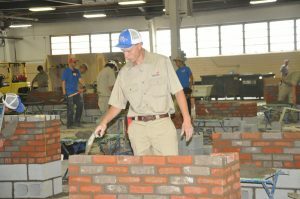 Howell, a recent graduate of the Masonry program, finished twelfth in the nation. 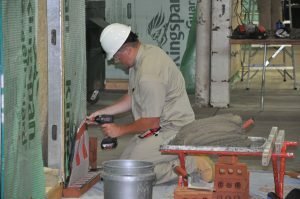 Peyton Scott checks his work during the Post-Secondary Masonry contest at the SkillsUSA national leadership and skills contest in Louisville, Kentucky. Scott, a first-year student, finished seventh in the nation at the event. 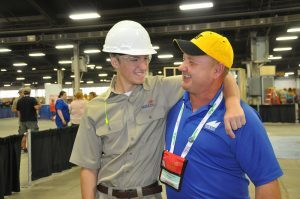 Following three days of construction during the Team Works national SkillsUSA contest, Electrical Technology student Jadon Norris shares a congratulatory hug from his instructor Wayne Ford. Norris and his team placed eighth in the nation. Follow Meridian on Facebook for more photos taken during the Esthetics, Crime Scene Investigation, Secondary Team Works, Post-Secondary Team Works and Masonry SkillsUSA national contests.